Nuha Alshaar joined the Institute of Ismaili Studies in 2009 as a Research Associate, where she focuses on ethical concepts in early Qur’an interpretation, and on the relationship between the Qur’an, tafsīr, and classical literary traditions (adab). She also teaches Islamic Intellectual History and Thought, as well as Arabic Literature at the American University of Sharjah. Dr Alshaar has taught at various academic institutions, including the School of Oriental and African Studies, University of London, and Queens University Canada in the UK. She is also a member of the Arabic-German Young Academy for Science and Humanities (AGYA). Her publications include Ethics in Islam : Friendship in the Political Thought of al-Tawḥīdī and his Contemporaries (Routledge, 2015) and the co-edited volume Sources and Approaches across Near Eastern Disciplines (Peeters, 2013). Though there have been many studies on the Qur’an’s importance in tafsīr (Qur’anic commentary), there are comparatively few which look at the impact of the Qur’an on other forms of literature. The Qur’an and Adab : The Shaping of Literary Traditions in Classical Islam bridges the gap in the scholarship by placing the Qur’an in its broader cultural and literary contexts. 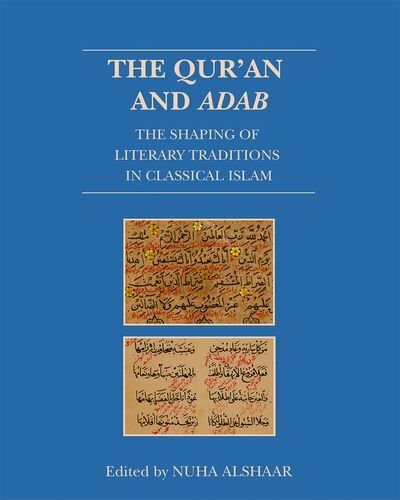 It explores the Qur’an’s relation to classical literary traditions (adab) from pre-Islamic times until the fifteenth century CE, focusing on the various ways in which the classical literati (udabāʼ) engaged with the Qur’anic text, linguistically, conceptually, structurally, and aesthetically, to create works that combined the sacred with the profane, thereby blurring the boundaries between formal tafsīr and adab. Through a detailed introduction and a series of case studies, the volume rethinks the concept of adab and the relation of scripture to humanistic traditions in classical Islam and questions the general classification of adab as belles-lettres. It examines the religious aesthetic found in different types of adab works—poetry, literary criticism, epistles, oratory traditions, anthologies, ’mirrors for princes’, folklore, and mystical/Sufi literature. Featuring contributions by leading scholars, the collection investigate the intertextuality between pre-lslamic poetry and the Qur’an, and the innumerable approaches to the Qur’an by classical authors. It discusses the various citation techniques employed in the udabāʼ’s borrowing of Qur’anic language, concepts, and stories. The chapters explain how the choice of these techniques was determined by the literary conventions of the particular genres and contexts within which the udabāʼ were working, as well as by their authorial intention, theological, and ideological outlooks. They also highlight the link between the functions ascribed to Qur’anic quotations in a specific text and the need to convey a particular message to specific audiences.